Enzo Bonafe is one of only two men’s shoe factories left in the area around Bologna, Italy. 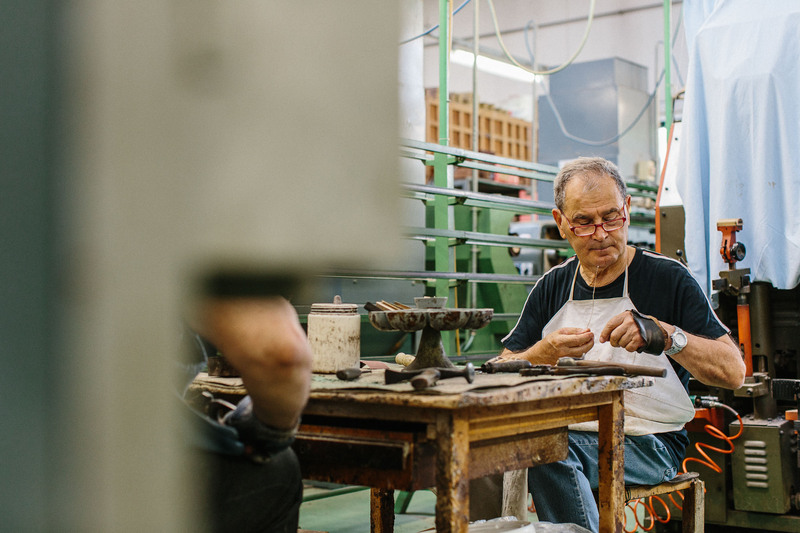 The other is Testoni, and when Enzo left Testoni to set up his own factory, in 1963, there were more than 40 factories in the region. It has been a rapid decline. The factories that survive in Italy today - as in the rest of western Europe - are the ones at the top of the market. Those making the best quality, using the best materials, and remaining innovative. Bonafe is set apart in that regard (certainly compared to English shoemakers) by still hand welting and (partially) hand lasting its shoes. The functional benefits of each of these techniques is small. 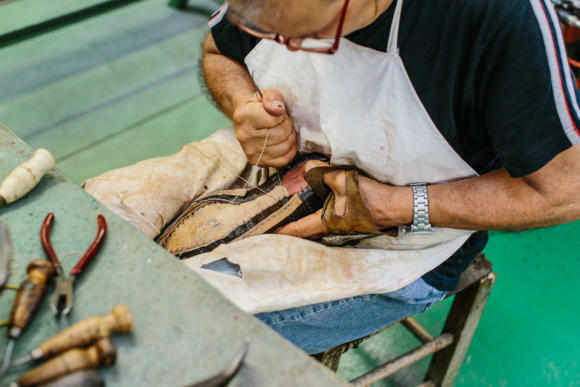 Hand lasting (above) arguably gives the shoemaker greater control over how the leather is stretched onto the last, allowing him to adjust and react to what is a natural, inconsistent material. Hand sewing the welt means two interweaving lines of thread attach the welt to the upper, rather than the simple fetch-and-hook system of a sewing machine. It’s stronger and more reliable, but only at the margins. Both techniques, however, push Bonafe shoes towards the quality level of bespoke shoes. And they have long been abandoned by most factories. Above is one of the two Bonafe workers that does hand sewing. Both are getting on, although there are plans to train younger people. In total there are 25 people in the factory, which is in an industrial estate outside of town. Five women work at home, doing the closing. Five of the 25 in the factory are members of the Bonafe family (Enzo below). 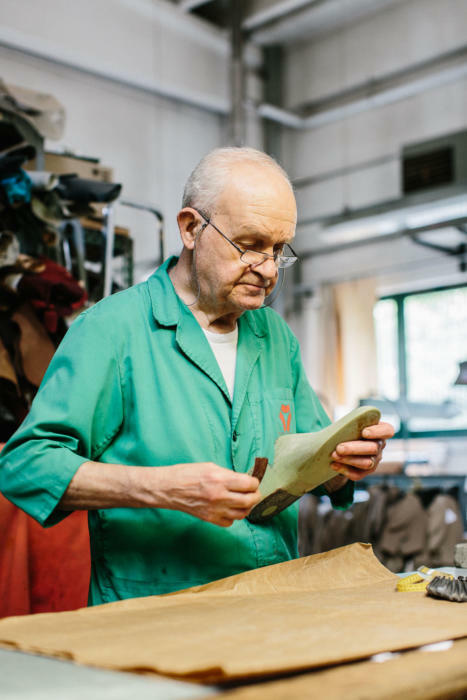 Enzo’s story in shoemaking goes back to the Second World War. His family lived in the centre of Bologna, but had to move out of town when it started to be bombed. They moved to the mountains, and for the first time little Enzo needed shoes. “We were very poor, and in the city you could just walk barefoot on the pavement - all the children did,” he says. 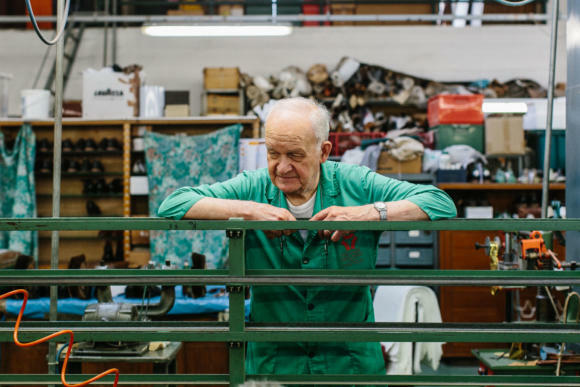 Back in Bologna after the war, he found work in a shoe factory - aged 13. He was very ambitious, and by 1963 wanted to start on his own. His wife (above) also worked at Testoni, and she helped him with design and finishing in her evenings. Initially Enzo sold shoes to stores in Bologna, Milan and Genoa, most of whom would use their own label. Even today, the majority of Bonafe’s white-label work (about 20% of production) is for these old, traditional stores in Italy. In Japan, on the other hand, Bonafe has been sold as a brand for over 30 years. Japanese customers have always been very supportive, and there is even a collaboration with a Japanese women’s designer in Italy, Le Yucca’s, that has done well. There is a full list of stockists on the Bonafe website here. Unfortunately none in the UK, but Leffot stocks the button boots (below) and Skoaktiebolaget in Stockholm has a big range. Patrik, Gabriel, Oliver and the team at Skoak have had a big role in bringing Bonafe to wider attention in recent years. 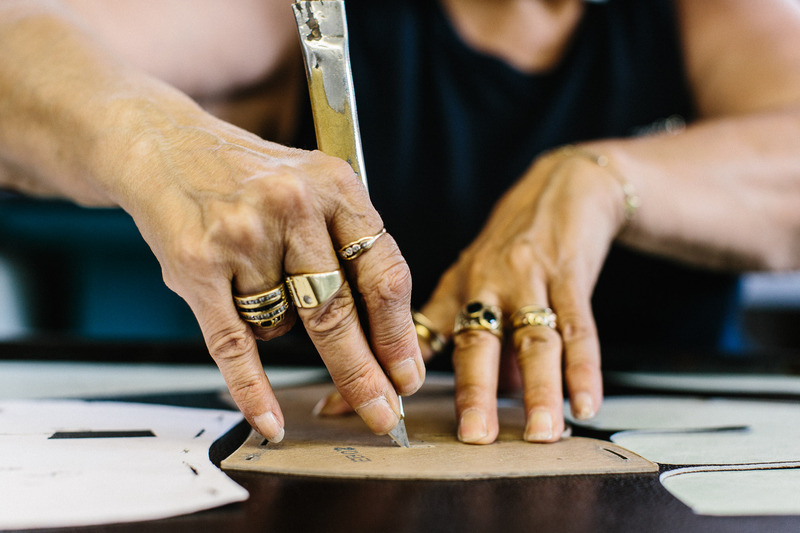 “We develop most new styles today through coordination with our customers,” says Massimo. One example is a double-monk boot in a hatched-grain leather, which consciously echoes their most famous model, the button boot. For me, this is perhaps the area where Bonafe is weakest. Although most of the production is under their own brand, Massimo admits they still have the attitude of a factory - focusing on quality and process rather than design. When you walk into the showroom, there is a huge range of shoes and boots around the walls, in a staggering array of materials. But many are a little old-fashioned. 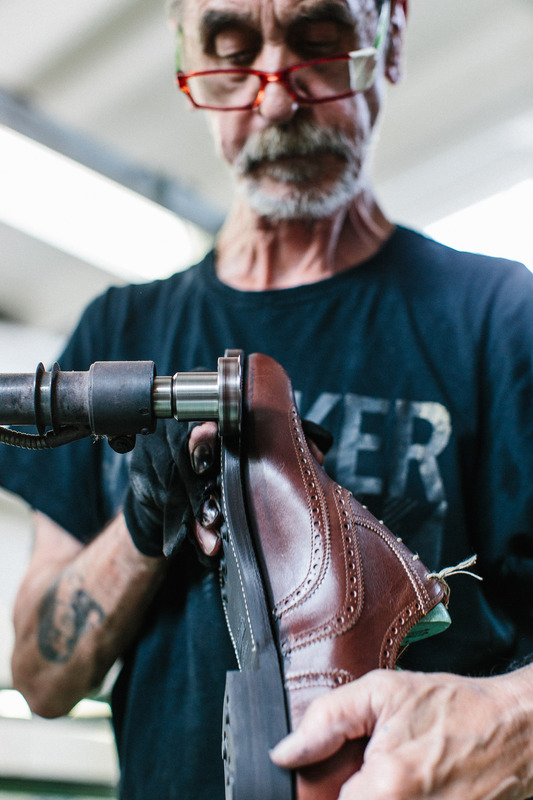 The oldest is a thick-soled wingtip from 1968, and there are models from every era since. 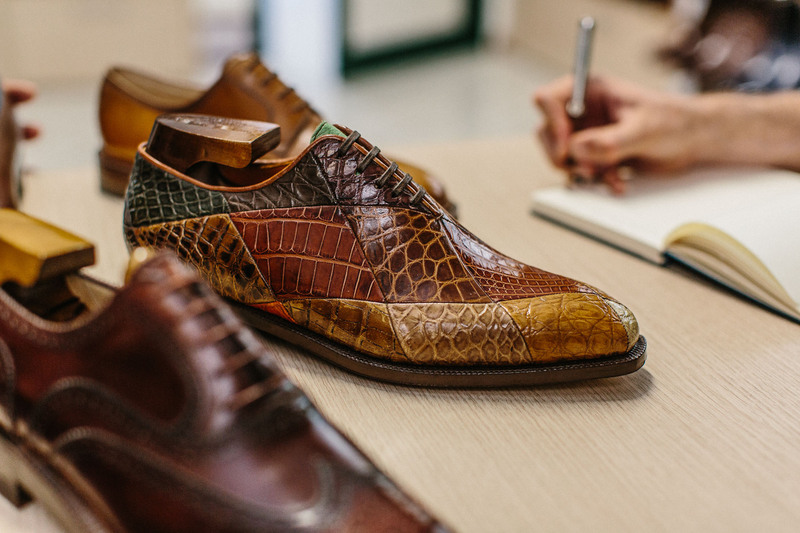 The patchwork alligator shoe (both below) that was made for the company’s 50-year anniversary is definitely a statement of manufacturing prowess, not modern design. This is hard because another one of Bonafe’s key strengths is its flexibility. The factory’s small size and experienced staff mean that it can offer a very broad MTO programme, with different heights of its hand-built heels for example. It also offers some customers a programme to adjust lasts, and even bespoke lasts for a lucky few. I haven’t had a pair of Bonafe shoes and cannot comment on them as a customer. I’m sure others can. However, the company does have manufacturing quality, versatility and some great styles. 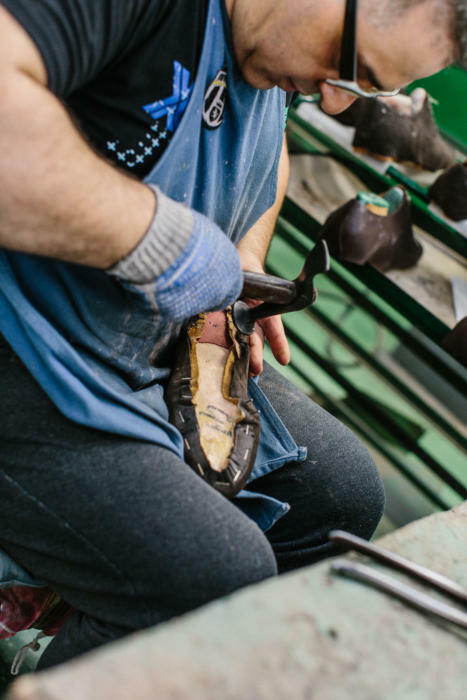 Hopefully they will be able to retain the Bologna shoemaking tradition for a long time to come. 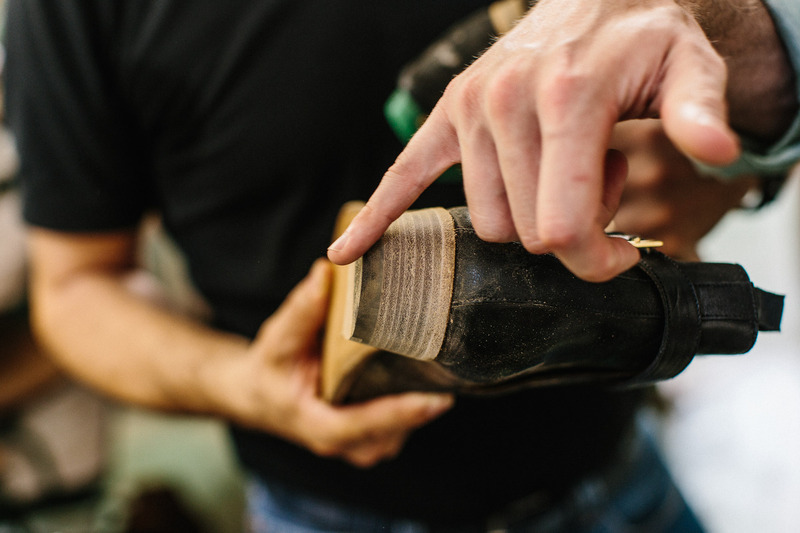 You can follow the discussion on Enzo Bonafe hand-welted shoes – factory visit by entering your email address in the box below. You will then receive an email every time a new comment is added. These will also contain a link to a page where you can stop the alerts, and remove all of your related data from the site. I bought a pair of split toe Bonafé derbies from Skoaktiebolaget via a group pre-order. The shoes looked quite nice at the outset but the leather was of poor quality and degraded rapidly with wear. The patination was also terribly badly applied. I was offered no redress by Skoak other than a 10% voucher for my next purchase (I accept that distance shoe purchasing is a complete lottery). Cut-price Edward Green Dovers these are not. I’d attach pictures of the offending articles here if I were allowed to do it. Other makes / models may be far superior but I’m out. Thanks Rob, interesting to hear. A little off topic: I know you do not often wear a belt, but would you recommend a suede one with suede shoes, or would you consider that – as the Americans say – matchy matchy? Would you mind leaving this on a post mentioning either a belt or suede Martin? One of the strengths of the site is that people do use and read the old posts. I am curious: is that for John Lobb St James or John Lobb Paris? To my understanding the leather quality of John Lobb Paris is phenomenal, possibly due to its ownership by Hermès. 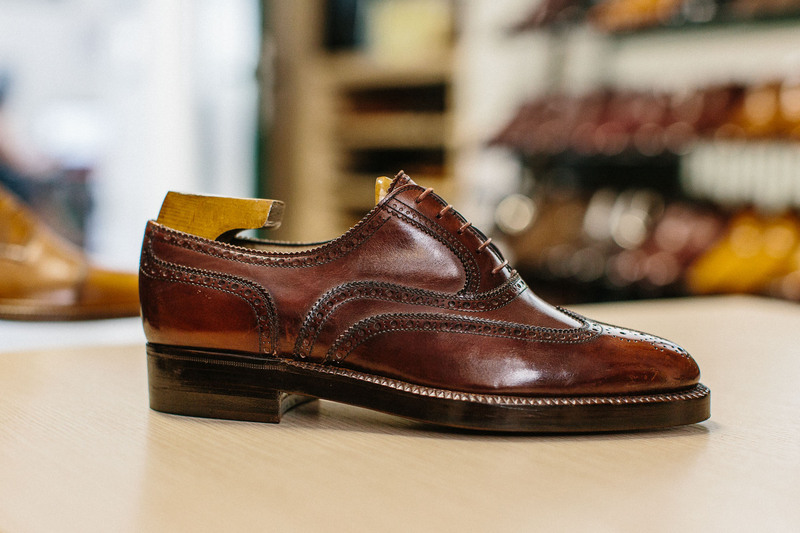 John Lobb Paris – we’re just talking about RTW. I have two pairs of shoes from them, and I haven’t noticed the leather being any better than Edward Green or G&G. Now that you mention it Simon, here’s an interesting story I heard. I recently bought three pairs from the C&J near Harrods for my dad, who unlike me prefers the conservative round toes of English shoes. The store manager there told me that their top shelf shoes – the hand-grade line – use the same leather as Greens and Lobbs. This is apparently because their contracts with the tanneries, many of which later bought out by Hermes, have not yet expired. do you have informationen what leather they use? 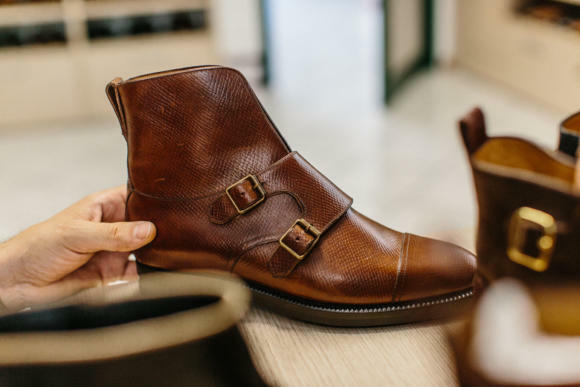 My italian shoemaker only uses vegetable-tannend leather from Tuscany which is of high quality. very promising and the techniques he uses seem to be similar to Bonafés. I have AM shoe I would say its step above EG for sure (finishing wise), in terms of construction they got different range some are hand welt some are not (their method of GW, not exactly GW suppose better). I like them better than my EG, GG has a strong design element that if you like it’s hard to find other to replace, though AM’s waist is tighter than GG even on the non hand welt range (not comparing to GG deco as I don’t have any deco). Nice read! Just to make it clearer, the pro with hand welting vs Goodyear welting is mainly the fact that with hand welting you stitch the welt and the upper directly to a thick leather insole, with Goodyear you stitch it to a canvas rib which has been glued to a thinner insole. The stronger seam also is a good thing with hand welting, but not necessarily the main one. SkoAB in Sweden introduced me to Enzo Bonafé two years ago. I am proud owner of five different pairs now. I have tried RTW, Group MTO and also had the pleasure to order in consultation with Massimo at a trunk show in Stockholm. I had a small fitting issue with one of my RTW oxfords (tight on toe), which Massimo and Gabriel helped to resolve. Extremely friendly and customer oriented people both from SkoAB and Enzo Bonafé. The comment about quality of leather does surprise me a bit. So far, I haven’t experienced this even with some serious wear in difficult weather…to be seen. I also appreciate the story of Enzo and his drive to grow his family business but in a sustainable and “home-grown” manner! Just my personal experience. I’m really happy that your needs were met. I suspect being at SkoAB in person helped a lot. I am able to visit Edward Green in person and that helped massively. But as I said my three pairs of EG Dovers really are on another plane to the Bonafé shoes I received. You have some criticisms about their design, but can you elaborate on that? They clearly don’t have the modern look of Gaziano & Girling, but I think all the shoes I’ve seen of theirs look fantastic and wearable today in various settings. They have some great designs in the range, absolutely. But rather than G&G, which has an obvious and strong aesthetic, if you compare them to Edward Green, EG is constantly refreshing its models, designs and leathers – refining a last shape, or introducing an unlined version. Bonafe doesn’t have a design approach in this regard – rather, they are more like a manufacturer, whose attitude is they will make whatever the customer wants. That’s not necessarily bad, but I worry about their future in the long term as a brand on that basis. Other manufacturers have had similar issues. I agree in general. But I think there is one great exception – the button boots. That is sort of a trade mark for Enzo Bonafe. But I totally agree on G&G, they have really managed to have a common look on a lot of different models. I have two pairs of Enzo Bonafe shoes. A suede tassel loafer and a suede oxford. I think that they are great. The oxford was MTO and Enzo could adjust the last to my foot with no extra charge. I think they are good value and better than C&J Handgrade that costs about the same. 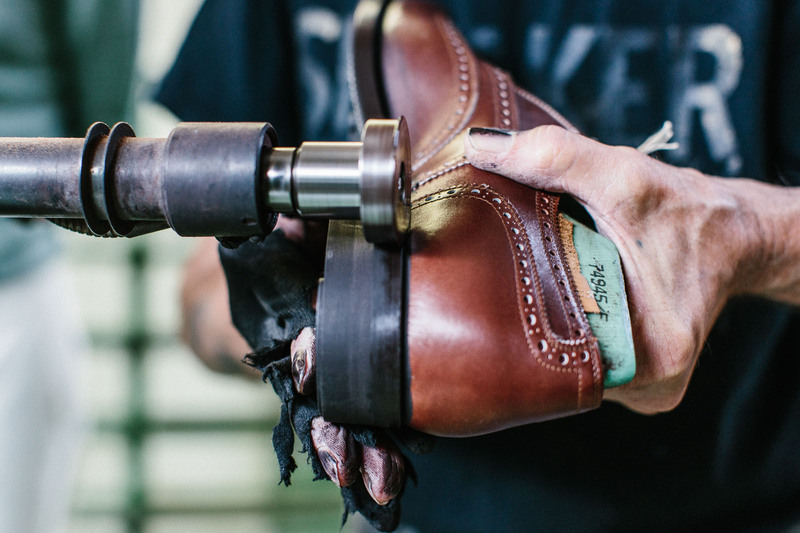 Enzo Bonafe makes also shoes for Paris-based shoe brand Aubercy. Their design is slightly (or sometimes completely) different from what Enzo Bonafe suggests for their customers. I have had shoes from Aubercy for 7 years now and is very satisfied with quality and ageing. Recently, I have ordered shoes at Skoaktiebolaget after an appointment with Massimo here in Stockholm. It would be interesting to see how these shoes will age with time. Enzo Bonafe does not probably provide the same level of quality as Edward Green, but I do not want to buy Edward Green at all. EG looks too expensive for my eyes, and is too expensive in terms of the price level. What I need is a discrete elegance at reasonable price, and that is exactly what Enzo Bonafe delivers as a producer. I am always baffled by this….can anyone tell me why Edward green shoes all circa £900? For me in RTW they are No. 2. No.1 is of course silvano Lattanzi- absolutely rolls Royce in RTW shoes. Excuse me but I don’t accept any gemming in RTW shoes at all because in reality it’s no real Goodyear)). 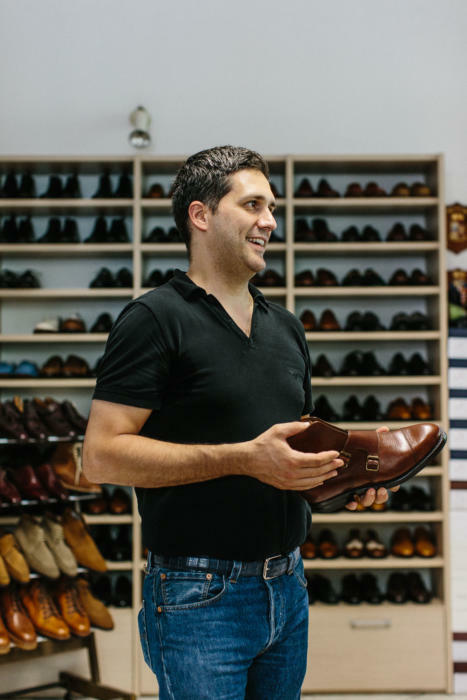 If their functional benefits are small, but using the techniques pushes Bonafè (he seems to prefer a grave accent) shoes toward bespoke quality, wherein lies the relevant difference? Simon, I own a good selection of Edward Green and G&G shoes which I am very happy with. However, over the last few years I have developed a very arthritic big toe which makes wearing shoes uncomfortable. As a result, unless I in a meeting or at a wedding or similar, I wear trainers more often that not, which annoyingly makes my suits largely redundant. Wearing trainers with a suit is ridiculous but would smart trainers be acceptable with an odd jacket and trousers? Also, can you recommend any acceptably smart footwear that is cushioned and more forgiving than traditional shoes? Common Projects, maybe? Thanks for the wealth of information and forum you provide. Personally I wouldn’t wear a trainer with a tailored jacket, but if you have to then yes a very softly made sports jacket and trousers in a casual cloth (eg cotton, maybe flannel) would be best. Very casual tailoring, basically. And smarter shoes, so Common Projects or something equally simple and sleek in the last. 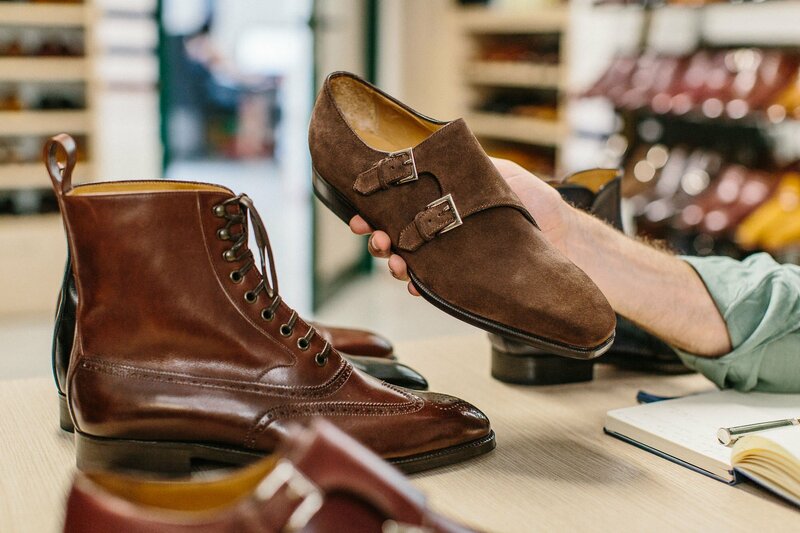 If you want a formal shoe that’s adapted for your toe, maybe look at someone that will adapt the last, like Saint Crispin’s. How would you compare Bonafe with Paulo Scafora ? Will you be reviewing the Jeffrey West for M&S autograph “bench made” collection at all? They seem to be a high quality but an affordable option, compared to the likes of Edward green or Stefano Bemer, I assume they are made in Northamptonshire? No. The designs are pretty pointy and horrible, like most JW. I suppose it’s all a matter of taste, I very much like the pointy designs, it seems to complement my stick like figure. I’ve also owned shoes from G&G which are also quite pointy, would you say that they aren’t to your tastes to? I bought a handmade (but not custom made) pair from Skoaktiebolaget in a Norwegian toe design. They have a wonderful leather grain and the stitching is incredibly executed. Very handsome. They are still breaking in, but I think they are going to be terrific. I have a pair of personal lasted, Made to Order, balmoral boots, using their blue Bettis calfskin. The quality of the construction is comparable to Saint Crispin, yet the fit superior, and the price even better so for the value. The finishing was also very nice, to add, with the heel and sole edges actually hand ironed and pressed like that of typical bespoke. All customizations were done in cooperation with SoleGarb in California. I don’t know why you would think that handwelting is only marginally better than other constructions. It’s a leather tied to leather contact, in contrast to the goodyear welt, now notoriously perverted, using glue to attach. As of right now, with all that bespoke shoes that you have, you should know better than all of us that handwelting is superior. Thank you Travers, that’s great to hear on the boots you have. Handwelting is absolutely superior, however I put it as of marginal importance given that it has made no real difference to how any of my shoes – RTW or bespoke – have lasted or worn. Thanks for the kind words. I have not the time to take some pictures, but the boots are wearing rather nicely. They are definitely not bespoke, but feels very light, nicely fitted (not the best fit, still, but that’s part of the first pair), and the customizations may nearly be endless. Understandably, yes, most people who wear goodyear welted – these most people would rather notice it – will never find a fault on the shoes or its constructions, but often times, GYW produce noticeably heavier shoes – my Saint Crispin and Enzo Bonafe does not weight anywhere nearly as much as my Meermin boots, despite being double HAF soled – and also, what you cannot see is sometimes the thing that unravels (pun intended) all of it. I recall seeing your Edward Green shoes in the “How great things age” series. Remember when they had to replace your insole because the canvas ribbing does not hold up anymore, despite looking like it does hold up? Maybe time had its effect, but if the memory serves me right, that canvas rib, the heart of the GYW, was glued on, and failed right there. Granted there are repair services for it, still, it constitute that it had realistically, not just theoretically, failed at some point. It just so happens that it is what that does not meet the eyes. Thanks, and good point. It’s one thing that would have been a bit easier to fix. And good point on lightness too. 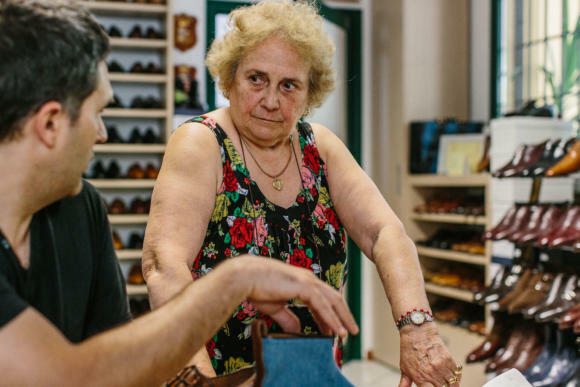 When dealing with a bespoke shoemaker such as Enzo, who seems relatively disinterested in bespoke and who only does it occasionally, would you have reason to worry that his/her skills and execution might not be strong given less practice and focus? Or is that not something to be concerned about? I have contacted the factory who told me I should talk with their resellers. After talking to two shops in Italy they both told me this model is only sold in the US and in particular in LA. 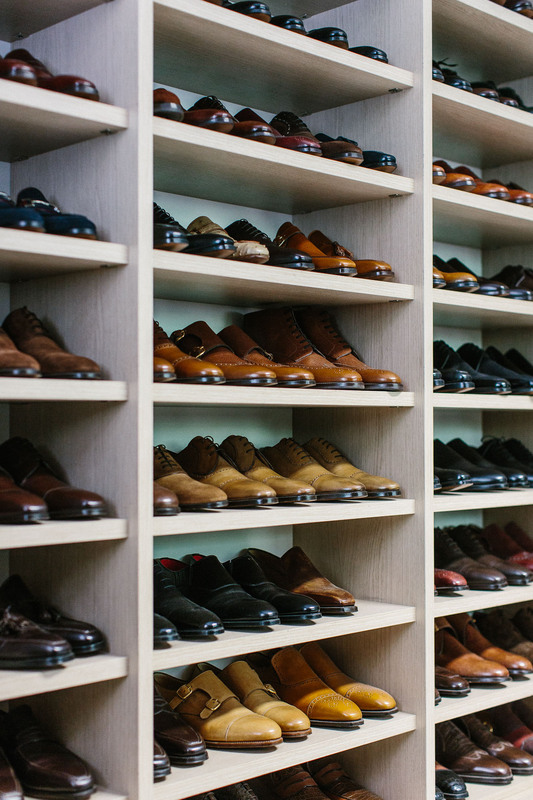 How would you compare the overall quality of EB shoes with high-end RTW shoes like EG, John Lobb and G&G? Better value I guess, but do they have the same quality in general. I am looking for a classic cap toe oxford.